Bib Suit / Hooded Jacket Combo Buy Now! The bib suit coupled with our hooded jacket, makes a fantastic weatherproof rainsuit for every outdoor enthusiast. 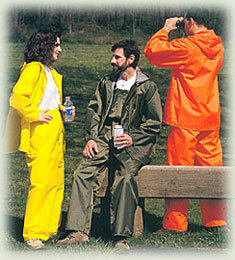 Bib overall pants provide superior protection from rain or damp weather while hunting, fishing or hiking. Our bib rainsuit includes durable bib pants and lightweight hooded jacket. Both bib pants and hooded jacket feature durable, breathable fabric and include spacious storage pockets. The hooded jacket features a durable outer flap, rustproof zipper and a second flap to securely seal off all openings against the elements. The hood is roomy enough to fit over your favorite hat or can be used alone to provide direct protection with an easy pull of the durable drawstrings. Jackets also feature special flap pockets to keep pocket contents secure and dry. Proudly made in the U.S.A. and featuring a durable, yet feather light fabric with breathable microscopic pores to ensure comfort in any weather. Available in sizes small - 5XL. Copyright © 2019, Kool Dri Rainwear. All rights reserved. Web Design & Hosting Provided By EZMarketing. Kool Dri Rainwear sells men's and women's rain wear including motorcycle rain suits, rain parkas, camouflage jackets, fishing rainsuits, and other waterproof rain suits.